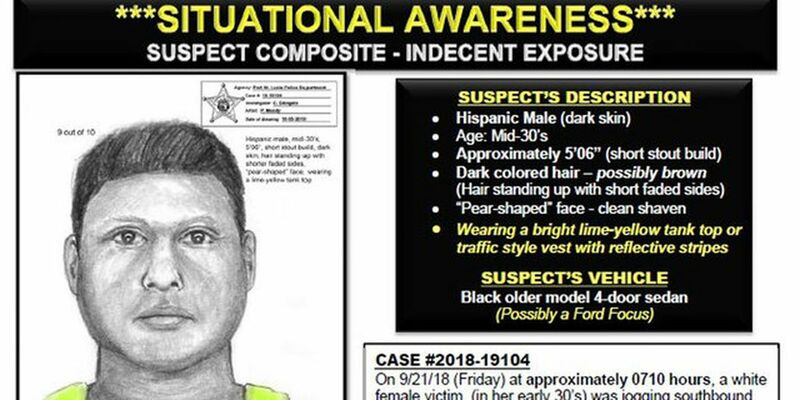 Port St. Lucie said Monday they are working to identify a man who exposed himself to a female jogger last month. On Sept. 21 at about 7:10 a.m., police said a woman in her early 30s was jogging along NW Baletto Street when she saw a dark-colored, older model four-door sedan drive past her. The vehicle then parked near the cul-de-sac in the neighborhood. A man wearing a bright lime-yellow tank top or traffic style vest, was then spotted exiting the vehicle and walking around. The jogger said the man then went to the back of his vehicle and was masturbating with his pants pulled down to his ankles. She said he was staring directly at her when she ran inside her home. Shortly thereafter, the man fled the scene in his vehicle northbound on NW Baletto Street. Police said they are looking for a Hispanic man in his mid-30s, about 5 feet 6 inches with a short, stout build, dark skin. His hair was standing up with shorter, faded sides and a pear-shaped face. Call Detective Chris D'Angelo (772) 344-4077 or Treasure Coast Crime Stopper 1-800-273-TIPS if you can help in the case.